LONG BEACH — The grand opening celebration for Rosa Parks Park will be held at 10 a.m. today at Alamitos Avenue and 15th Street. The park, funded by the Long Beach Redevelopment Agency, will include items that celebrate both the neighborhood and the courage of Rosa Parks. Together with Long Beach Transit, 6th District Council member Dee Andrews has worked to have a bus stop in the park that will serve the residents and the nearby New Hope Senior Home. 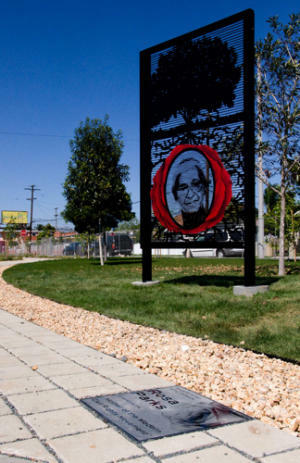 According to Andrews’ office, about $100,000 was requested from Long Beach Transit to enhance the bus stop and the commemorative art piece of Rosa Parks, which is the centerpiece of the park. “Roses for Rosa” by artist Pat Ward Williams uses a rose as a visual theme for the Rosa Parks Park. 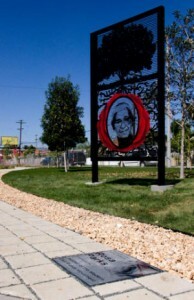 A portrait of Rosa Parks can be seen in the roots of a “Heritage Tree.” Black granite tiles sandblasted with Rosa Parks motifs and biographic information are placed along the walkway. Larry Jackson, president and chief executive officer of Long Beach Transit and Robyn Peterson, chief operating officer and senior vice president of Long Beach Transit, were instrumental in assisting with the funding and is committed to the project, said Andrews. “Long Beach Transit is extremely honored to have been a part of this project recognizing Rosa Parks, which will be a wonderful asset for the community and LBT customers,” Peterson said. Other features of the park include a walkway surrounded by native plants, a decorative raised planter and water friendly landscaping. There are a total of seven benches at the bus stop, each named in honor of the local community religious organizations that have nourished the foundation of the Central Area and have adopted the park to keep it clean. During today’s event, Andrews will dedicate an oak tree, named the “Tree of Equality,” to recognize the contributions of Long Beach Branch of the National Association for the Advancement of Colored People (NAACP) and its president, Naomi Rainey. Articles copied from The Oakland Tribune.